Remodeling our powder room was one of the first projects on my to-do list when we moved to our new home. But where to start? Check out the before pictures. The powder room was functional, and although beautiful with its gold walls and crystal chandelier and sconces, it wasn’t my style. It was more of a french provincial style and I wanted a modern farmhouse style bathroom. The crown molding is very ornate, and I was going for a very clean look. I wanted something stylish, elegant and bright. 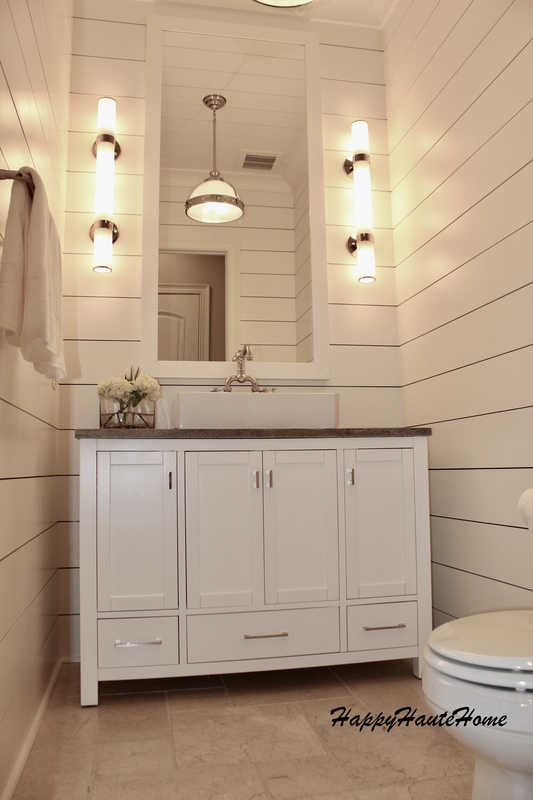 I’m crazy about shiplap and knew I wanted to incorporate it in my house, this looked like the perfect space. Construction begins! We tore apart the room, the vanity was very hard to rip out due to its size and unfortunately the marble broke in the process. We decided to relocate the fan to the corner of the ceiling. Next came the shiplap installation. In a future post, I will detail my research for choosing shiplap, there are so many different styles and materials to create the shiplap look. Next we try to install the vanity..guess what…doesn’t fit. The walls are 58.5″ and the vanity is 55″ – I thought that would fit…Boy was I wrong! My husband explains to me we need to measure the hypotenuse to find the correct fitting vanity. WHAT??? Hypotonuse!!! What are you talking about??? Just make my vanity fit Please!!! Isn’t going to happen, the hypotenuse is larger than the width of the wall. The mathematical equation won, back went my beautiful vanity. UGH…back to square 1. I ordered a smaller vanity at 45″, which I love! I was able to customize the vanity top. Since we were installing a wall mounted faucet and vessel sink, I didn’t want the predrilled holes in the counter top. The only hole we needed was for the drain. I chose a silver travertine counter, which looks beautiful with the shiplap. Check out the finished product! One of my absolute favorite features in the bathroom is this gorgeous faucet. The french country bath style with a polished nickel finish is stunning. This faucet is reminiscent of an old country french chateau. We installed the pop up drain pull on the side of this beautiful square porcelain vessel sink . A beautiful pendant light completes the look. I wanted polished nickel hardware on the cabinet so I went with Jeffery Alexander pieces, they added the perfect touch. I am thrilled with how this project turned out. What do you think? Drop me a line. For more great ideas, subscribe to the blog! See you next time! Thank You Nicole! This bathroom has been one of my favorite projects, I had so much fun putting it all together. Hi Pamela, the boards I used are 8″ wide. I chose them because our ceilings are 10′ high. For a typical room with 7-8′ ceilings, I would use 6″ boards. I considered 10″ boards, but since the powder room is a small space 8″ worked great. Does that help? Really depends on the space and height of ceiling. Wow. It looks so much brighter!! Beautiful transformation. Thank you Jamie! We love it. Beautiful powder room, quite a change. Pictures are great. Thank you, yes it it very different than the original.